This is just one of my simple appetizer recipes. I like Armagnac, I like foie gras, and prunes are health food - what more do you want? Obviously this recipe is made with foie gras of duck, not of goose! I prefer duck, and I live in the southwest of France: duck country. Force-feeding geese is cruel, as they resist. Ducks don't resist like geese, and the feeding only takes 2x 10 seconds a day during the last two weeks of their 3-4 month life. The ducks are typically free-roaming (I cannot judge the practices in China and eastern Europe, but countries where humans have no rights, animals have even less). Compare that to the horrible life of industrial chickens! And, of course, this recipe is made with Armagnac, not Cognac! Armagnac, France's premier brandy, is distilled once, has character, and you can taste the primary fruit. Cognac is distilled twice, and does not. Cognac is literally watered down to 40% (80 proof), Armagnac is not. Armagnac is produced in the Gascony region in the southwest of France. Say no more! My recipe for terrine of duck liver and fig compote is here (incl. how to make foie gras mi-cuit). 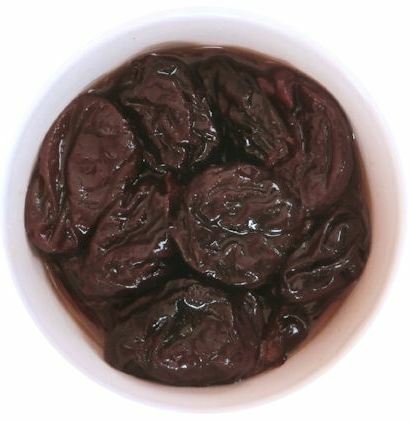 the prunes should be moist, not bone dry! 75 grams (3 oz.) of duck "foie gras"
avoid "bloc" foie gras: it is industrially produced pâté. Do not discard the left over Armagnac. It's the cook's dram! May be served on a platter with toothpicks, or on individual spoons. If the prunes look a little tired by the time you serve them, just sprinkle or brush some Armagnac on them. Also tastes great the next day (if there are any left over and are covered with plastic wrap). 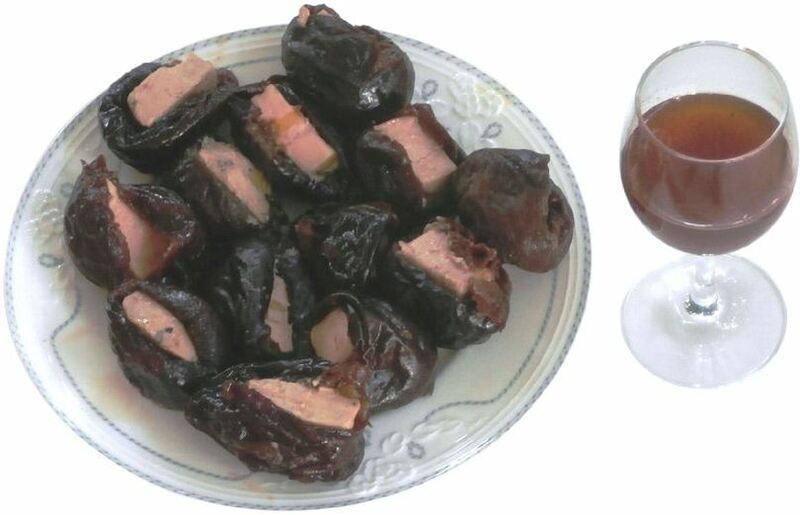 Can also be made with (dried-but-moist) figs instead of prunes. ©2000-2019 F. Dörenberg, unless stated otherwise. All rights reserved worldwide. No part of this publication may be used without permission from the author.